Sri Lanka is a year-round beach destination; it is encircled by sandy beaches that align the coast towards the horizon into the blue waters of the Indian Ocean. Beautiful golden beaches on the west, the south and the east coasts of the island are real tourist attractions on this paradise island, the ‘Pearl of the Indian Ocean’. They provide visitors with the ideal conditions for sunbathing, swimming or water sports like wind surfing, diving. The beauty of the beaches is enhanced by coral reefs, serene bays and lagoons. Negombo is a characteristic traditional Roman Catholic fishing village (35km north of Colombo) just a ten minutes drive away from the Sri Lanka’s International Airport & is renowned for its pristine beaches and delicious seafood from both the sea and the lagoon. The lagoon and the Dutch period Hamilton Canal enhance the beauty of the town. In earlier days in history, Negombo was a rich source of cinnamon spices. In the 17th and 18th century it was ruled by the Portuguese, the Dutch, and the British. Reminders of these European days can still be found in Negombo, such as the Old Dutch Fort, which was built in the 17th century and is situated close by a cricket green where matches are a big attraction. Due to large catholic population here, and the churches belonging to many orders, it is also known as ‘Little Rome’. One of them is ‘St. Mary’s Church’, where beautiful ceiling paintings can be seen. Furthermore, the Buddhist temples like the ‘Angurukaramulla Temple’ is worth a visit. The town is set in lush groves of coconut palms; it breathes the spirit of the sea and is an ideal location to spend the first few days and the last day of the holiday on the island. Around the lagoon local fishermen are at work with their dugout canoes or ‘oruvas’. The robust ‘KaraWa’ fisher folk bring their daily catch of crabs, prawns and sea fish to the markets. 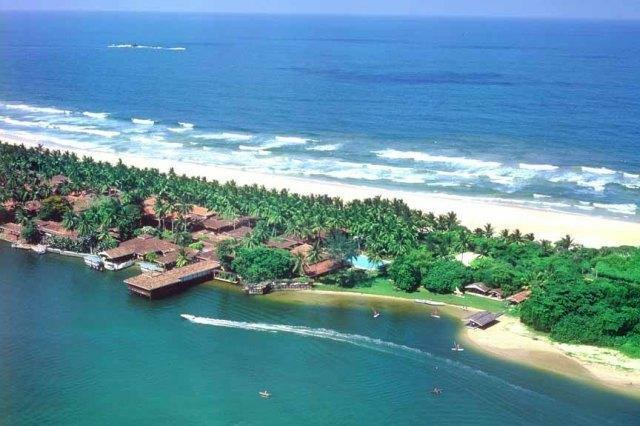 The small town of Marawila is located north of Negombo and offers a beautiful and quiet beach, surrounded by coconut plantations and palm trees. The Mt. Lavinia beach resort area is situated just south of Colombo. It derives its name from the love story of British governor Sir Thomas Maitland who was amazed of Lovina Aponsua at his welcoming ceremony in 1806. Lovina was a daughter of the performer troop manager from a low caste and was not allowed to cover her breast. Sir Thomas Maitland selected this area to build his holiday mansion, because it was on rock at a higher elevation than the surrounding areas. Apart from this mansion, he also built a tunnel from the vine cellar of his house, (which is now the main kitchen of the Mt Lavinia Hotel), up to the cottage of Lovina where their courtship started. Although they remained faithful to each other, he was unable to marry Lovina, since the governor was from a famous aristocratic family in Britain. At the time of his departure he named this area after his lover, and passed a law that no matter what cast they belong to, all damsels should cover their breasts. In 1877 this mansion was turned in to Mount Lavinia Hotel. The beach at Mount Lavinia is pleasant, considering the proximity to the Colombo city and being just 5 minutes walk to the main road. There are many beachfront restaurants serving both international and local dishes. 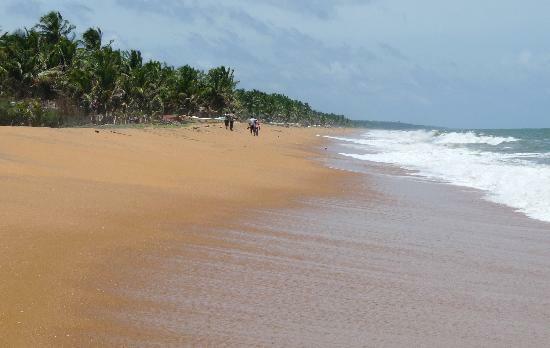 One of the best golden beaches on the west coast can be found in Bentota. The village is close to the Bentota river. A boat ride on the river is worthwhile. In Bentota many possibilities for water sports exists. The village of Kalutara is located 40 km south of Colombo, and is separated from Wadduwa by 8km of beach. Kalutara has a reputation for its basket weaving, and for the best mangosteens seasonally available in Sri Lanka. In earlier days, it was ruled by the Portuguese, the Dutch, and the British. During that period Kalutara was a very important trading centre for spices. On the main road, south of the Kalu Ganga Bridge, the popular Buddhist temple named ‘Gangatilaka Vihara’ can be visited. This temple has a hollow ‘Dagoba’ (shrine), which is painted on the inside. Furthermore, there is a small Bodhi Tree along the road, where offerings can be made to ensure a safe trip. The village of Beruwela is situated 60 km south of Colombo. Beruwela is well-known for its fine golden sandy beaches. In the year 1808, the first Muslims of Sri Lanka settled down in this village. On the place where they landed, on a headland situated a little north of the hotel area, a mosque was built: the ‘Kechimalai Mosque’. Every year, at the end of the Ramadan, it is an important site to celebrate the ‘Id-ul-Fitr’ festival. It is a village that offers a stretch of nice beaches and is located along the Galle Colombo Highway, close to Bentota. Sea turtle projects are common in this area of Induruwa, Kosgoda, and Bentota. Turtle eggs are protected in coast side hatcheries. 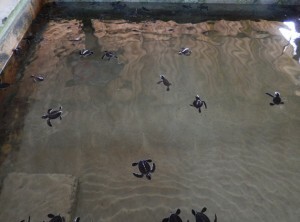 The tanks contain hundreds of on to three days-old turtles. You may find a few large ones too, including Albinos. You can release a few baby turtles back to the sea from the hatchery. The exciting beach town for under water delights is Hikkaduwa, which is located 100 km south of Colombo. The coral reefs of Hikkaduwa are world famous. The coral reef garden can best be explored by glass bottomed boat or scuba diving. The water over the reef is only up to four meters deep. Beautiful reef fish and other exotic species can be seen, for example the Parrot, Lion, Unicorn, Porcupine, Moorish Idol, Emperor Angel, Powder-blue Surgeon, Clown fish, grouper, stingray, marlin, caranx, jack, tuna, snapper, barracuda, shoe-lobster, octopus, murray eel, and manta. There are plenty of shops that sell curios and ornaments. The Buddhist temple ‘Gangarama Maha Vihara’ is interesting to visit, because it has educational paintings. At the Hikkaduwa lake, boat tours can be organized to spot birdlife and see monitor lizards. There are also many water sports facilities available. The beach resort of Hikkaduwa has good surfing and traditionally attracts surfers from all over the world. The best time of the year to surf is from November to April. Swimming together with the sea turtles is also a wonderful experience. Furthermore, Hikkaduwa offers a variety of nightlife entertainment. There are many small restaurants serving good international food and fresh seafood dishes. Pubs, discotheques and nightclubs are a very common sight by the roadside in Hikkaduwa. 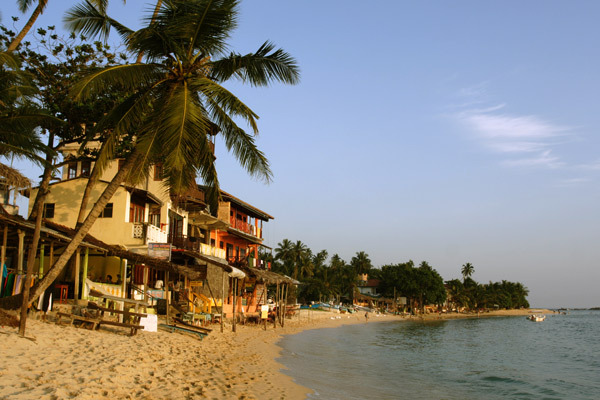 Unawatuna is a peaceful wide curve-shaped bay south of Galle, with beautiful golden beaches. There is a reef that protects the beach, which makes this a very suitable area for swimming. The bay is popular for surfing activities. Snorkelling is a good way to explore the coral reef and view exotic fishes and other sea life. There are also mysterious old submerged ship wrecks, which are interesting to see during a wreck dive. On the west side of the beach, the ‘Rumassala’ rock can be found. The legend goes that Hanuman brought this rock from the Himalaya when he searched for medicinal herbs. This place is a busy fishing village, situated in a sandy bay 30 km south of Galle. The name of Weligama means ‘sandy village’. Nearby the coast, is the small island ‘Taprobane’, which once functioned as the retreat for the writer Paul Bowles. In the 1950s, he wrote his book ‘The Spider House’ on the island. Before that, Taprobane was owned by the Count de Maunay from France. It is possible to see sharks and dolphins, when going for a boat trip with a catamaran or a motorized boat. Other activities that can be done are snorkelling and scuba diving. The village is renowned for its lacework, which is offered for sale along the coast. Very interesting to view are the stilt-fishermen, whose unique style of fishing involves casting their lines from a perch on a sturdy pole 20-50 meters out to sea. The easy-going town of Tangalle is situated on the south coast, about 200 km from Colombo. Reminders of the Dutch presence can be seen, such as the Rest House, which was built in the 18th century and is one of the oldest to be found in Sri Lanka. On the west side of the coast there are small bays, while on the east side there are beautiful long stretches of white sandy beaches. Activities that can be done here are scuba-diving, to see coral fish, puffer fish, stingrays, and reef sharks at the coral reef. Furthermore, there is a steam ship wreck (150 years old), and a large cargo ship wreck (20 years old). Nilaveli beach is located 275 Km east to Colombo in one of finest tropical beaches and dive spots in Asia superior to the better known popular beaches of the south coast. The east coast offers a different holiday experience of Sri Lanka. And it is said, that Nilaveli is a paradise for surfers. Only a short drive from the eastern coastal town of Trincomalee, for years Nilaveli was the holiday destination of the selected few. A clean secluded beach is approached through a tangle of trees where there is white sand sloping gently with miles of picture perfect shores into a clear, shallow ocean. Arugambay area offers world-class surfing, deserted beaches, a 2000 year old ruined temple, wild elephants, monkeys, an astonishing range of flora and birdlife in the near by jungles, wetlands & Yala and Lahugala national parks nearby.